Bob Bunting, a friend, meteorologist, and accomplished professor, has offered his insight on climate change via this guest commentary, It’s Hot and Getting Hotter – The Case for Adaptive Strategies for a Warming Planet. We appreciate his perspective and invite you to join the conversation. As humanity contends with a hotter planet, more volatile weather, and higher sea levels, adaptive strategies offer a win-win approach for now and for the future. Where climate change is concerned, to fail to act is to plan to fail; but by proactively implementing adaptive strategies we can spur economic activity in the present, preserve property values and lifestyles, and help to ensure a viable future. Back in the late 1970s and 1980s I was fortunate to be a scientist and executive at both NOAA and the National Center for Atmospheric Research, NCAR. During this period the signal on manmade climate warming emerged from the noise. The first global atmospheric climate model went into use at NCAR. The early runs with and without the impulse of greenhouse gases put into the atmosphere by humans produced stunning contrasts. Without human greenhouse gas inputs, the model forecast little change in global temperatures; but with the impulse from mankind, the climate forecast indicated a troublesome warming during the 21st century. From that time onward, people fractured into climate-warming advocates and deniers. Led by remarkable consensus among scientists worldwide, the climate-warming forecast has seeped into the collective consciousness. The NY Times Magazine recently featured a comprehensive review of what happened in Washington during the climate-warming realization period prior to 2000. The article detailed how and why the opportunity to limit climate warming was missed. At the time, many perceived a dramatic rollback of the carbon footprint of humans as hurting the US and other developed economies while simultaneously allowing developing counties to continue dirty development with old carbon-producing technologies. Realizing that this difficult tradeoff was unlikely to be adopted, NCAR leadership began promoting the adaptive idea that climate warming presented a great economic opportunity for a technology-rich America and other advanced Western countries. Imagine developing India and China, whose goal was to turn the lights on for a few billion people, receiving cleaner-burning power plants and other more efficient technology from the West, thereby leapfrogging past their existing and soon-to-be-built dirty, high-carbon/high-sulfur coal power plants. Given the present state of affairs in 2018, it is clear this adaptive message fell on deaf ears! We can’t undo the past, and significant global warming is already baked into our future, so where can we go from here? Our message of 40 years ago is still the most effective one I have heard. Climate warming is not a theory but an unfolding reality. We estimate that the global temperature has increased about 1.1°C, or about 2°F, since 1880; and sea level has risen approximately 10 inches. Humankind can best deal with the consequences of climate change in an adaptive way that limits losers while maximizing winners. The imperative of slowing down, ending, and/or mitigating greenhouse emissions has received all the headlines. Meanwhile, unfortunately, the adaptive message has been lost. In addition to curbing emissions, we need to prepare for climate change that is already in the process of happening. I hope to move your thought in the direction of adaptive strategies because these strategies put us on the critical path to lasting solutions. But before we move forward, we need to grasp where we are now in the climate-warming scenario. In the face of the rises in both global temperature and sea level, we continue to debate what is causing the global changes we have observed. The troublesome truth is that anthropogenic climate change is underway, and limiting additional greenhouse gas inputs from CO2, nitrous oxide, methane, etc. is critical to limiting the magnitude of the warming over the next few centuries. Even if miraculously the world could stop carbon emissions today, the Earth would continue to warm, and sea levels continue to rise until at least 2060. By then our children and grandchildren will be as old or older than we are now! It is in the best interest of our generation and the next few generations to focus on adaptive measures that can mitigate many of the impacts that we see now and that will increase over time. Humans must learn to address longer-term threats posed by climate change and act to protect future generations. Adaptive strategies are at least part of the answer. For those of us living along the coast, managing sea level rise, for example, could well preserve our way of life now and for the next 50 years and probably beyond. We can, for example, preserve the value of our real estate, limit insurance premiums, and enhance the enjoyment of our adult and/or senior years. These and other benefits make adaptation personal and align with human instincts of self-interest and preservation. Think, too, about the economic opportunities for small and large businesses that provide the adaptive solutions we need. Using the coastline as a continuing example, coastal engineers will design shoreline protection against additional sea level rise; providers will make or deliver materials to selectively harden and soften the shoreline to manage the rise and buffer more frequent and dangerous storm surges; consultants will help government on local, regional, and national levels to bridge the gap between need and implementation. We know that 80% of the world’s 7.5 billion people live close to the shore, and in Florida alone $6T of real estate is on the beach! Moving inland, agriculture is likely to be an area where adaptation will pay large returns as the climate warms. The grain belts are located in many interior regions of the major continents. The US grain belts in the Midwest and plains, for example, will probably endure more frequent droughts and changes in the prime growing season. Drought, if not countered by adaptive strategies, could result in lower average crop yields. Adaptive strategies could include adjustments of planting and harvesting dates, changes in crop varieties, planting drought-resistant plants, separating fields with windbreaks, intermingling plots for grazing with those for planting, and developing alternatives for crop insurance. I could go on, because there are hundreds of adaptive strategies in many economic segments that would mitigate the worst impacts of likely climate changes while enhancing economic activity. This is why I predict that adaptive climate change mitigation will become one of the fastest-growing and most lucrative business categories of the 21st century. We ought to help business see this opportunity and catalyze it for everyone, and the sooner the better! So what is holding us back? One thought is that scientists necessarily present a range of outcomes and not precise forecasts, given the many uncertainties of making long-range predictions. The result has been a range of outcomes from 2°C to 6°C in temperature rise and 8 inches to 6.6 ft. of sea level rise by 2100. Given this large range, the impact could be quite manageable (but still significant) at the low end of the range and catastrophic at the upper end. If you take away only one thing from this missive, it should be this. By 2100 the most likely range of temperature rise is, in my opinion, an additional 1.2–1.5°C rise in temperature and about 10–14 inches of further sea level rise. 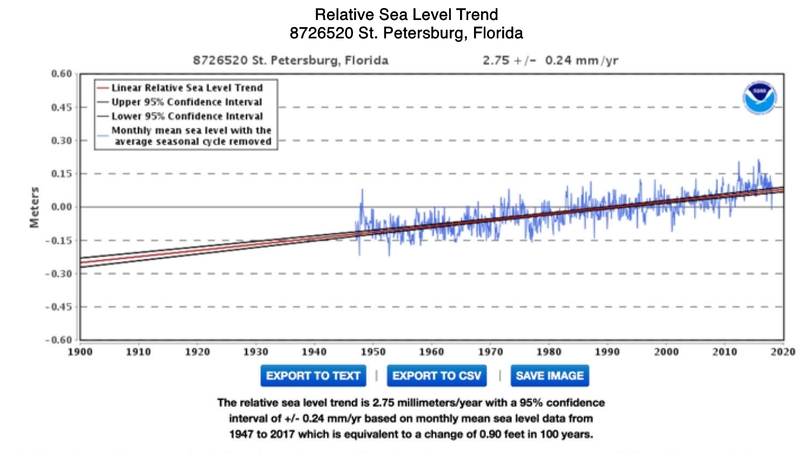 In order to reach these numbers, the current rate of sea level rise will have to advance from about 1 inch every 10 years to double that rate over the next 50 years. While these numbers are not pleasant, they portend real-world impacts that can be managed if we stop arguing about whether climate change is natural or manmade and start acknowledging that either way, the climate is warming and sea level is rising now. It isn’t productive to wait for a 100% consensus as to the reasons for climate change. In the limited sense, who cares why? We all need to care about and address the adverse impacts no matter who or what is responsible. We buy insurance all the time for outcomes that are far less certain than climate warming and sea level rise. This is the message I have carried to business leaders, local government officials, and national congressional leaders in my sphere of influence. You can help by doing the same! Bashing the media is not my intention, but the media becomes part of the problem when they hawk worst-case and least-probable scenarios. Sensationalizing promotes fear and creates a “deer in the headlights” syndrome that results in inaction. Showing, for example, how NYC could be underwater in 50 years without also classifying such an occurrence as about a 1% probability event is not helpful. Headlines presenting the worst-case and lowest-probability scenarios are both devastating and depressing because they tend to delay implementation of adaptive strategies. When people feel they have no options because they are going to be underwater, they are more likely to flee rather than to adapt. While climate warming has a fat-tail risk that should not be ignored, that risk also shouldn’t be the driver of paralysis that it has become. If, however, the most likely scenario is presented, i.e., one with, say, an 80% chance of happening, society would be encouraged to move forward and to maintain our assets and lifestyle by taking adaptive measures. It is vitally important that we switch gears now while we still have affordable and viable options. It isn’t too late! A final piece of the puzzle is quite encouraging. Knowledge is advancing at such a rapid pace that 50 years from now we may well have ways to sequester carbon and reverse climate warming. In my short lifetime, I have witnessed an incredible and increasing rate of change in human knowledge and technological progress, as I am sure you have. The knowledge tsunami is accelerating and is a cause for great hope and an affirmation that it isn’t too late. 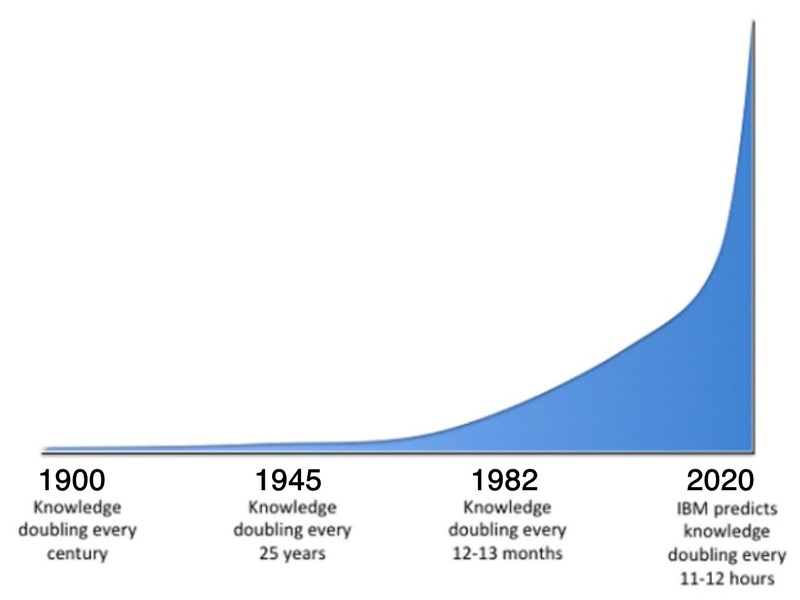 Buckminster Fuller introduced his knowledge-doubling curve in 1982, about the same time as climate warming became a worldwide concern. With the help of IBM, the curve was modified and is shown below. I don’t have the data to show exactly where we are on the knowledge curve today, but I think the overall point is well made. Adaptation to climate warming and sea level rise is not a hopeless activity. It is as necessary part of a wider solution that is sure to come as our knowledge grows exponentially. We can and must give humankind the chance to solve the climate crisis. We need to get to work now on doing just that by implementing adaptive strategies! Please bring this message forward, and I hope you will! Bob Bunting is a scientist, entrepreneur, educator and the author of a financial newsletter at bobsstocks.com.